Graffiti vandalism is more commonly carried out using aerosol paints. These tools are easily accessible, light to transport and simple to use, making graffiti more common than ever. This ease of use is great for street artists but it means trouble for property owners. Quick and simple art projects can spring up around any property and at any time! The sad truth is that there is no way to prevent graffiti from finding its way onto your walls but there is certainly a way to get rid of it and to discourage a repeat offence. It does not matter if you are living in the middle a suburb, an urban area or an industrial park – graffiti happens! Spray painting can be a form of expression, but for the most part, it is a small signature or tag. Tags act as signatures, but instead of one artist leaving their mark, it can mean competition! Street artists are notoriously competitive which means one tag invites others around it. Once paint is firmly planted on exterior spaces, every minutes that passes by creates a more problematic stain. Sitting marks soak deeper into exterior construction materials, making their removal harder. Leaving paint to sit for days, weeks or months at a time can turn a basic removal into a complicated cover-up. Spray paints might be easy to find but effective graffiti removal products are not. Any marketed paint remover will claim to strip away graffiti but that is not always what you want! DIY removal techniques are known to make graffiti matters worse. Pressure washing can drive paint stains further into porous surfaces while chemicals can lead to paint bleeding. Our Gorillas work using specially designed removal products to remove direct stains along with any shadowing left behind. For those spaces that have been left over long periods, paint colours can be matched to ensure a complete coverup. Once proper results are achieved, it is time for graffiti prevention methods! An anti graffiti coating might not be able to stop paint from happening but it can make future removal much easier! Some property owners might go as far as to install surveillance cameras around homes, commercial spaces or multiunit properties in order to discourage street artists. You don’t need technology to stop vandalism when you have a Gorilla in your corner. A Gorilla specialist removes spray paint while keeping properties looking their best. 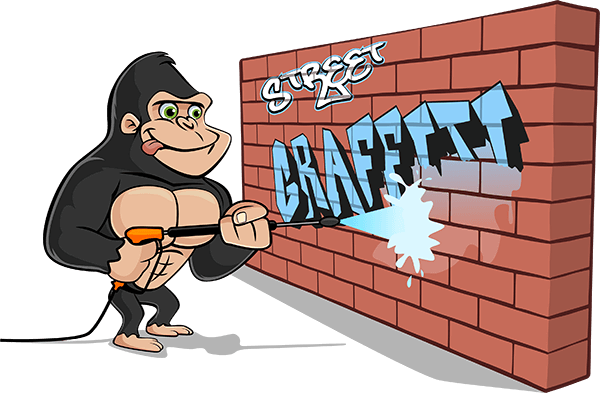 Don’t call 311 for your graffiti removal tips, when a graffiti cleaner like Gorilla Property Serrvices is available right in your own neighbourhood.